Welcome to my farm! Okay, okay...confession time! I don't live on a farm, and I never actually have. I grew up in a city neighborhood in Columbus, Ohio. The house lots were pretty average in size, and there were no beautiful rolling hills, pastures, or fields to be seen. Funny thing was though...I went off to college and one day my theatre professor looked at me and said, "You, my dear, grew up on an Appalachian farm in the middle of Columbus, Ohio!" Now she knew full well where I actually lived: had even been there and met my mom and dad. She realized I wasn't raised on an actual farm, but she was trying to tell me that the way I was brought up had shaped me differently than most others around me. (She was from the rural Ozarks herself, and since the two areas share a lot of similarities, I guess she had a little authority on the subject.) That statement of hers sure has stuck in my mind since then...and I believe more all the time that she certainly was right. 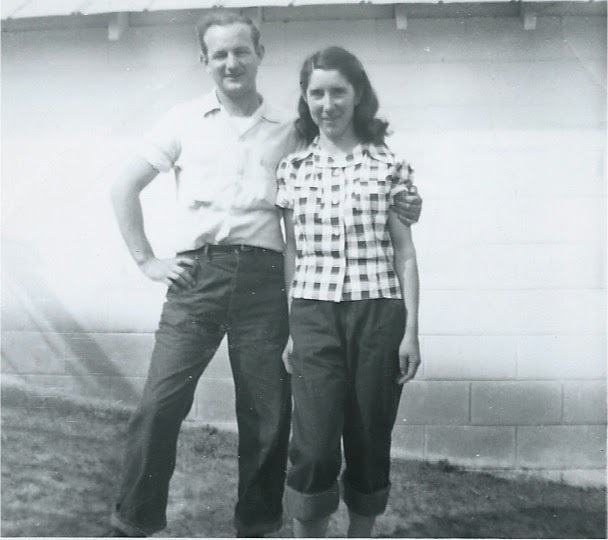 You see, not long after they married in the late 1950's, my mom and dad left rural Eastern Kentucky and headed north to look for work. (If you're reading this blog, you're probably very aware that this was a common occurrence.) Like so many others who migrated, they settled down, adjusted the best they could, had children, and went on about their lives. But boy, oh boy...that "adjusted the best they could" part was extra challenging for my mom and dad. Or maybe, I guess you could say, they just didn't actually try to change to fit the mold of those around them. My parents clung, and clung hard, to who they were. It didn't matter how their neighbors, co-workers, or anyone else up north was living their lives...Mom and Dad unapologetically marched to their own beat. And that beat sure sounded more like an old timey mountain ballad being played on a sweet, lonesome, southern hilltop than anything else! Something else that I've noticed through the years is that these negative comments and stereotypes about Appalachia haven't just shaped the outside world's opinion of the southern mountain region. They've really done a number on many of those that have left the region, and that effect has trickled down to their children, grandchildren, etc. When others, out of lack of understanding, make fun of who you are and/or where you came from, it naturally creates a motivation for assimilating and just wanting to blend in with the crowd. Because, let's face it, who wants to stand out like a sore thumb within a community? But too much blending in creates a tremendous loss...a loss of identity, a loss of culture, a loss of connection, a loss of shared values, and a loss of history. Pretty sad...especially when culture, connection, shared values, and history can help keep youth or anyone afloat when peer pressures and negative influences try to tug us in the wrong direction. But now, to the point of this blog... What if...? What if those with Appalachian roots openly celebrated who they are? What if they felt tremendous pride about their origins? What if we, as a community of Appalachians outside Appalachia, suddenly embraced and shared all that is good about the culture? And what if this Appalachian community outside of Appalachia truly felt like a community, and the shared identity was so valued that it actually became trendy? Imagine the influence we could have over the outside world's opinion of Appalachia! Could we, as residents of this outside world, help color all the negativity with something closer to the truth? If this sounds like a worthwhile endeavor to you, I hope you'll join me often here at Appalroot Farm, as I offer tips, fun ideas, and inspiration for celebrating this beautiful culture that we share! My hope and prayer is that this blog will serve as a reminder that we really do have so much to celebrate! I've just found your blog, thru pinterest (of all places) and I am so very glad to have done so! God Bless!! I'm so glad to hear that, Kim! I should be getting another blog post out within the next couple of days. You can follow Appalroot Farm on Facebook or Twitter as well, and that way you won't miss any new posts. :) Blessings to you as well! I have experienced the same cultural clash through my father who's parents moved to Michigan in the 1940's. He was from Maggofin Co. He worked so hard to lose his "hillbilly" identity by assimilating. It wasn't until he was established as a veterinarian that he finally became proud of his heritage. Oh I miss that "sing songy" language. My grandparents and father are now gone, but when I hear someone speak who is from Eastern Ky I become so nostalgic. I truly believe my roots belong there. Now I am completing my genealogical search and found that my father's family came to Eastern KY after the American Revolution through a land grant given to my ancestor Capt. Henry Connelly for his service. The majority of my family remained there even when my grandparents moved north for work. Sorry for such a long response, but I love this blog. Connie just another girl from eastern Ky... been to Columbus a lot.. shopping trips to the Penney's outlet mall, Schottensteins, and many more..
Connie, my family is from just a couple counties south of Boyd. Very familiar with Ashland and Boyd, Co., though. I have passed through there my whole life. I LOVE the Jesse Stuart Foundation in Ashland...have stopped in there many times! Ate lunch in Ashland last month while passing through to my family's old home place. One of my great grandfathers passed away in Ashland at the old hospital there many years ago. Thanks for commenting...and I hope you enjoy the blog! Blessings! I"m from Floyd Co, the town of Wayland. I live in northern Ohio now, but head south as often as possible. Those hills just feel like they are giving you a big hug. They sure do, Five Blessings Farm! Glad you found this blog...I'd say Floyd Co. is just a hop, skip, and a jump from where my family is from, but it's more like just a hop! :) Blessings to you! Hi Lorene, I just found your blog on Pinterest. I,too, am from Kentucky. I was born in Letcher county in 1949 and am the oldest of five children. My daddy was a coal miner and just couldn't make a living so when I was 4 !/2 y.o. we moved to northeastern Ohio. Talk about cultural shock. The other children in the neighborhood used to call me "hillbilly" and that really hurt. But I learned to live with it and eventually learned their twang enough that when I started school no one could tell I had an "accent" (or was it them with the accent? :) I ate the northern food and spoke in their tongue when at school and other places but at home it was completely eastern Ky--food, talk, everything. I met my husband at church and had three children who are grown with their own children now. One thing, I moved from Ohio to Virginia in 1986 withy my family and love it. The weather is much warmer than Ohio in the winter. My daddy died in 2000. He was slow talking, loved his garden and was a hard worker. Mom is still living in Ohio and doing well. I am a retired registered nurse and enjoy growing and working in the garden and yeard. I am happy to have found your blog. Blessings to you and your family. Oh, Tricia, thank you so much for sharing your story! Part of my family hails from Letcher County as well. I'm so glad you found my blog! Enjoy that warm Virginia weather...we're knee deep in winter here in the north. God bless! I just found this on Pinterest and I'm curious enough to read more. I'm a native child of East KY and moved back "home" after 20 years away - most of it in Cincinnati/NKY. There is great beauty here and I hope we can collectively and respectfully tell a new story, devoid of stereotypes, about out beautiful home. Yes, MaryBeth, that is my goal to tell a new story...the story I've known about Appalachia my whole life does not look like the one the media usually portrays. What a blessing to move back "home!" Blessings to you! I hail from WV.and have often told this story: I moved to Ca. and when I introduced myself the reaction to my twang was: Where are you from? I would respond with pride and say, West-by-God Virginia. They would avert their eyes to my feet to see if I was wearing shoes. I can't tell you how many times that happened. Most are uninformed as they confuse WV with Va. not knowing that they are in fact two states. I love the irony as these people have the opinion that my twang equals stupid and here they don't even know that WV is a state. Very ironic! Thanks for sharing your story! Hope you are able to find some pictures, D Phillips!